Our ‘Classic Antarctica’ trip took us to the South Shetland Islands and then to the west side of the Antarctic Peninsula, which is conveniently the closest part of Antarctica to South America, but also one of the best places to visit the white continent because of the many offshore islands and the channels1 between them and the Antarctic mainland. The Google Maps satellite image below shows the Peninsula and the Tierra del Fuego. We boarded the M/V Ushuaia, originally built in the 1960s by the U.S. for Arctic research, at about 4:30pm, and within an hour-and-a-half we had left the port, champagne in hand from the welcome party, and were navigating the calm waters of the Beagle Channel. The Ushuaia has space for 84 passengers, and its previous trip 10 days earlier was sold out, but in our case there were only 70 passengers on board. To everyone’s surprise, including their own, the 28 Dutch passengers made up by far the biggest national majority, while at the other end of the spectrum there were solitary travellers flying the flags of Brazil, Colombia (our friend Diana, who eventually married one of the Dutch men and moved to Amsterdam! ), Italy, Northern Ireland and Australia. Even though we booked the lowest class of accommodation on board, it was still quite nice and comfortable. We had our own two-person cabin with two bunk beds2 as well as a desk, wardrobe and sink, with a semi-private bathroom shared with a Dutch couple in the next cabin. After a late dinner, we were quite tired and went to sleep at about 10pm. Our boat, the Ushuaia, anchored at Neko Harbour. We awoke in the middle of the night to discover that the Beagle Channel was well and truly3 behind us, and that we were now navigating the treacherous4 open waters of the Drake Passage between Tierra del Fuego and Antarctica, which has been described as the roughest stretch of water on the planet. For those prone to5 motion sickness such as myself, the rocking of the boat made it virtually impossible to sleep thereafter and, when morning came, moving about the boat and doing basically anything except lying down was tough for me. To rub it in6, the crew kept saying how fantastic the weather was for the crossing and how calm it was and lucky we were. Outside it was indeed a gloriously sunny day (9.5 degrees Celsius), but it was wasted in the Drake Passage where you cannot see any land. In the afternoon, by which time I had become used to the swaying7 of the boat and could move around comfortably, we went out on deck8 and watched several different types of birds fly around the boat, some with wingspans 9 twice as long as a grown human. Having had a lecture on the birds of the Drake Passage earlier in the day, we all used our newly-minted10 expert status to differentiate between the different types of albatrosses and petrels. After dinner, we watched a documentary on the doomed early 20th century Antarctic voyage of Sir Ernest Shackleton and his men, who survived over a year-and-a-half in the Antarctic after their ship was wrecked without the loss of a single life. Then I put the missing pieces together of the story I was trying to tell some other hikers the previous week in Torres del Paine: Shackleton’s Australian photographer Frank Hurley, mentioned and quoted several times in the documentary, was the great-grandfather of my friend Flip, who is herself a kind of modern adventurer and made news for her (sadly aborted11) walk across Greenland. Because of the excellent weather conditions in the Drake Passage, we arrived at the South Shetland Islands, close to the Antarctic Peninsula, about 3-4 hours ahead of schedule which allowed for a bonus landing. For the first time since leaving the port at Ushuaia, we dropped anchor in the cove12 created by the half-moon shape of the appropriately-named Half-Moon Island, and prepared to make our first landing. 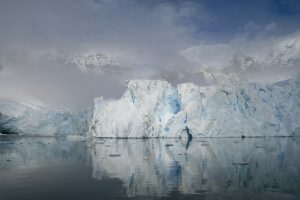 Unfortunately, the sun of the previous day had disappeared and it was pretty gloomy13 outside (3.5 degrees Celsius) – dark grey clouds blanketed the sky, lifting a few metres above the water level to reveal14 glimpses15 of glacial and snowy islands in an unusual light. But it wasn’t windy or raining, so while photographers weren’t too happy with the weather, both the ship staff and the penguins thought it was pretty good. 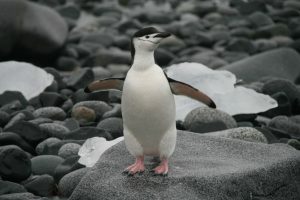 A chin-strap penguin on Half-Moon Island in the South Shetland Islands, near Antarctica. We took the zodiacs (rubber motor boats usually accommodating 8-10 passengers) to shore and disembarked, immediately seeing the first of two types of penguins on the island: the Chin-Strap penguin, so called because of a black line that extends from ear to ear underneath the chin like the strap of a helmet. Later we also saw the red-billed Gentoo penguin, and three different species of seal, including a baby that one of the staff said was the smallest he had seen in six years of doing these voyages. 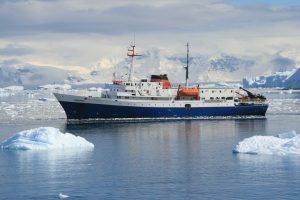 He added that on the Ushuaia’s previous voyage (i.e. the one we had tried to book but missed out on), they had not seen any seals on Half-Moon Island. Though we’d seen sea lions (very similar to seals) before in Peru and just a few weeks ago on the Península Valdés in Argentina, it was the first time we had seen penguins in their own environment, so that was quite thrilling. There were hundreds of them on the island, waddling16 about awkwardly as they do, and probably many more swimming offshore. Satisfied then with our first landing, we sat down to dinner and then prepared for the night crossing of the Bransfield Straits, known as the mini-Drake passage. “As you can see, conditions are quite Antarctic today…” came the morning announcement over the intercom17. Owing to heavy snowfall and poor visibility, we abandoned our first planned landing of the day at Hydruga Rocks and instead did a ‘cruise’ on the zodiacs (in 1.5 degrees Celsius weather!) through Gouvernøren Harbor. We saw a 1916 shipwreck but otherwise it wasn’t a great outing owing to the cold and the virtually horizontal snow fall, and we were glad to be back on the ship once it was over. In the afternoon, we reached the Antarctic continent for the first time and began navigating alongside it, a pattern that we would follow for the next several days. We also saw humpback whales for the first time (but certainly not the last, as sightings soon became routine). Our afternoon landing at Danco Island yielded more penguins and what would have been a spectacular 360-degree viewpoint, but clouds obscured the view in all directions. 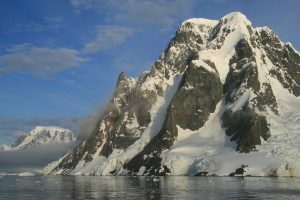 The conditions had made it a pretty disappointing day, but as we entered Andvord Bay, where we would anchor for the evening, our moods began to improve. The mist that had hung over Antarctica for most of the day disappeared, replaced by a blanket of deep grey clouds that, while still obscuring the views beyond the shoreline, created a surreal18 atmosphere. Navigating through this land of ice and snow and eerie19 light, I felt as though we were on a completely different planet. The scenery of Andvord Bay, Antarctica. I don’t even know how to begin describing how amazing this day was, but l will try this: if every other day of the voyage offered nothing but howling winds21, non-stop snow, no wildlife sightings and no views whatsoever, then the entire trip and the US$8350 it cost us would have been completely worthwhile just for this one day. It was, by far, the best single day of ‘travel’ we have ever experienced together and we saw easily the most spectacular scenery of our lives. The gorgeous scenery of Neko Harbour, Antarctica. Our morning landing at Neko Harbour, at the end of Andvord Bay, was our first on the Antarctic continent, and with the sun out and blue skies around us we trudged past Gentoo penguins through the snow to a lookout point offering spectacular views of the peninsula’s peaks, glaciers and green, iceberg-strewn waters. One glacier that we had been looking at from the ship since the previous evening now revealed itself to be a glacial iceberg that we estimated as being 10 times the size of the Ushuaia. After the extreme cold of the day before, we were actually hot and had to take off our jackets, and more than a few people got sunburned. 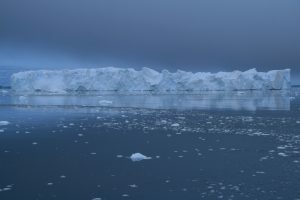 When we returned to the ship, it had been surrounded by small icebergs to create yet more postcard views. The stunning scenery at Skontorp Cove, part of Paradise Bay, Antarctica. Our afternoon landing, our second and last on the continent itself, was not as glorious, but remarkably, the highlight of the day was yet to come: a zodiac cruise in Paradise Bay that was so indescribably magnificent that even ‘jaded’22 travellers like ourselves were completely blown away. 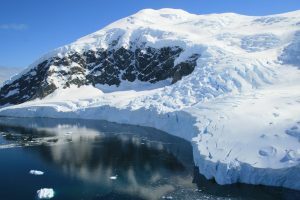 Icebergs, shimmering23 glaciers and snow-capped mountains combined to form a white wonderland that almost completely surrounded us and was brilliantly reflected in the Antarctic waters and immeasurably enhanced24 by the sunshine and blue sky. We approached an enormous glacier in our zodiac and sat there for about half an hour, mostly just staring open-mouthed at how incredible it all was. 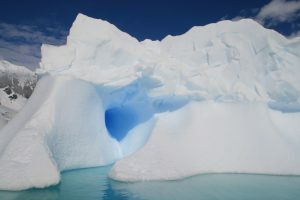 An extraordinary glacier at Paradise Bay, Antarctica. We eventually went right to the foot of it in the zodiacs. After dinner, we navigated through the stunning Lemaire Channel, no more than 150-200 metres wide at its narrowest point and with glaciers and peaks rising up from both sides. While I won’t ever say that the Perito Moreno glacier in Argentina wasn’t awesome, it’s kind of funny to think that today in Antarctica we saw literally dozens (scores25? hundreds?) of glaciers, many of them just as tall and beautiful, and all of them pristinely26 white with that magical shade of blue hiding in the cracks. Add in the odd humpback whale, the ‘afternoon sunshine’ (at 9pm) and the channel was indeed as fantastic as I’d hoped it would be. Mountains rise out of the sea in the Lemaire Channel, Antarctica. After watching sunset from the bow at 11:35pm, 18.5 hours and 750 photos since I woke up at 5am to go on deck and see if it would be a nice day or not, we stumbled into bed, utterly27 exhausted simply from looking at so much astonishing scenery. Waking up at 5:30am on Christmas Day is nothing new, but instead of running into the living room to open presents we instead made a very cold 6am landing on an ugly Antarctic Day on Peterman’s Island, the southern most point of the voyage. On Peterman, we saw our first colony of Adelie penguins (the third type we saw and the only one of the three exclusive to Antarctica) and three very small chicks, only 7-10 days old and still being sheltered around the clock by their mothers. Some light snow (and the blizzard28 that hit us in the afternoon) gave us a white Christmas, the first one I’ve ever had unless you count the pseudo-snow that surprisingly hit Mobile, Alabama, in 2004. 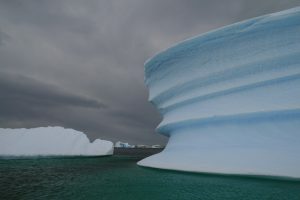 After breakfast, the day’s second excursion was another great highlight: a zodiac cruise through Iceberg Alley, a spectacular section of water dotted with29 hundreds of icebergs – small and big, sharp and curved, some with tunnels, others with brilliant shades of blue. We also saw an ice sheet with 14 crab-eater seals on it, which we were told was a significant number to see in one place. If we had the same weather as the day before, this trip could have been almost as magnificent as Paradise Bay (no easy feat30). In any case, the dark grey clouds overhead added another colour to the Antarctic spectrum and it was still a fabulous cruise. One of the many unusual icebergs in ‘Iceberg Alley’, Antarctica. Our afternoon landing at Dorian Bay was postponed because of the weather, but we were able to do it after dinner as a night landing at 9pm (‘night’ being a relative term31 in Antarctica in December, when it is never actually dark). But since it was pretty cold and there wasn’t any wildlife, it wasn’t an especially memorable landing. Our morning landing at Cuverville Island was probably my second favourite landing of the trip after Neko Harbour. There are 5000 pairs of Gentoo penguins on the island, the most we saw in one place on the entire trip, and even after many, many penguin sightings in the past few days it was still impressive to see so many of them. The setting was beautiful too, with icebergs and glaciers very close to the landing spot. 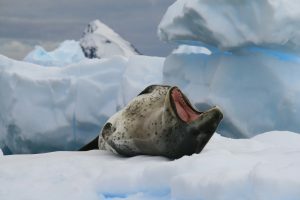 On our way back to the ship, we took a small zodiac cruise through the icebergs and we saw, relaxing on the icebergs, two pairs of mating leopard seals, which eat penguins and generally look a bit scary. I took probably my best wildlife photo of the trip of one of them yawning with its mouth wide open and icebergs and mountains serving as the backdrop. A leopard seal yawns on an iceberg near Cuverville Island, Antarctica. In the afternoon we finally saw baby Gentoo penguins at very close range at Port Lockroy and Jougla Point, which was fantastic and vindicating32 as that was one of the reasons we wanted to come to Antarctica a little bit later in the season. The babies were still brooding33, but every now and then we got a glimpse of one feeding or poking out from under their mothers’ bellies. 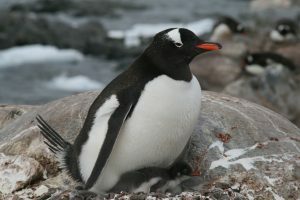 Since Gentoo penguins lay two eggs, we saw two babies under the same mother a couple of times and saw one baby with the other egg still unhatched another time (which means the first baby was no more than one day old). As part of the same landing, we also visited a British outpost at Port Lockroy, which was once a survey station and is now a museum and shop. A penguin with a chick underneath her at Jougla Point, Antarctica. These were our last landings about the Antarctic Peninsula. After dinner we headed back through the Bransfield Straits to the South Shetland Islands, where we would spend our final activity day before returning to Ushuaia. At 7:30am, we reached Deception Island, a remarkable volcanic island among the otherwise Antarctic-looking South Shetland Islands. It’s a circular island with a narrow entry, Neptune’s Bellows, which we passed through to ‘enter’ the crater. 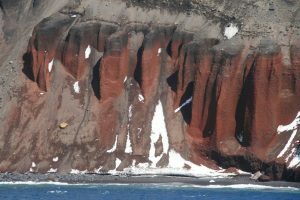 After days of seeing virtually nothing but white, to see black volcanic sand, dark red rocks and the other bizarre aspects of Deception Island was quite extraordinary. However, our proposed landing at Whalers’ Bay was postponed, and ultimately cancelled, due to 30 knot winds with gusts of 35-40 knots. The volcanic scenery of Deception Island, Antarctica. That left us with only one landing left, at the Aitcho Islands in the South Shetlands. The wind was not as fierce there but it was still a cold landing in dull conditions. It wasn’t the best of landings, but we did see an elephant seal for the first time (our fourth different seal species of the trip), though it was too young to have acquired the elephant-like features that give it its name. And since we knew that this was our last landing, we soaked it up as much as we could, admired the Gentoo and Chin-Strap penguins and reminisced about everything we’d done and seen in the last four or five days. After dinner we headed into the dreaded34 Drake Passage for the long journey back to the Tierra del Fuego. The journey back through the Drake Passage is always supposed to be rougher than on the way down, but somehow it was even calmer for us than it had been the first time. The staff were calling it ‘Lake Drake’ and saying that it was one of the best voyages through the passage that they could remember in years (though do they say that to every group?). 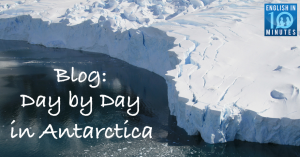 Without the anticipation of an impending arrival in Antarctica, the trip back was actually pretty boring and we spent most of it reading and eating. On Day 10, it became apparent that we were going to arrive in Ushuaia about 15 hours ahead of schedule, so we anchored in the Beagle Channel and had a celebratory BBQ and glass of champagne in the evening. After breakfast on Day 11, it was suddenly all over, but we will remember it forever as the best trip we’ve ever taken. Click here to listen to our podcast episode about Antarctica, or click here to see all our episodes.